I must admit I’ve always been a bit sceptical about these sort of things -products that claim almost to defy physics – using less water while giving you a power shower experience. That’s simply not possible – or so I thought. 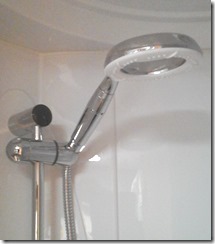 With our next caravan trip some weeks away (at the time) we tried the showerhead on our electric shower at home. Of unknown vintage, it’s never been the last word in luxury but adequate to get you clean. I put a new head on it – some cheap and cheerful thing – when we moved in a couple of years ago and made do. Having swapped to the new Ecocamel Orbit, the difference was immediately obvious. Yes, the water flow did seem significantly faster and it does this by drawing in air from the collar and adding this to the water flow. Not only that but it sounds faster and that’s perhaps part of the trick. The more we used it, the more we liked it and when we swapped the heads back the difference was even more noticeable. It used less water too. Using a very rudimentary method of calculation – a bucket, measuring jug and a stop watch app – with the Orbit showerhead fitted water consumption dropped by roughly a litre a minute. A significant amount when you add it up over a year. The important thing too is though it felt much better. However this product was sent to us as caravanners, so whilst being a great product in the home, how it performed in the caravan was much more important. Now unless you’re on a full service pitch, one of the regular tasks on site will be refilling the water barrel – or on board tank if you have one. If you use your on board shower regularly, clearly you’re going to be doing that much more often, so any device that saves water has got to be a good thing surely. And save water it did. With the temperature control in the middle, the factory fitted shower head would have used 20.25 litres of water in a five minute shower. With the Ecocamel Orbit fitted consumption dropped to 17.25 litres. 3 litres in five minutes. Again a significant amount – perhaps more so bearing in mind said water has to be fetched and carried. Moreover, the shower was so much nicer too. Ok, so it may not defy the laws of physics but it does very well. The design is really clever and it’s a standard fit so replacement of your old showerhead is simple and it looks pretty smart too. It is fitted as standard on the Buccaneer range of caravans from Elddis and an option on others. I have no hesitation in recommending it to both caravanners – particularly if you use your on board shower a lot – and those whose shower at home may lack a bit of life like ours. The Ecocamel Orbit showerhead can be bought direct by clicking HERE – it’s currently on offer and a free shower hose is included too. Also available is a soft water version – great if you are in a particularly hard water area (like us!) as it softens hard water and would be ideal for those with sensitive skin (like me!) and would leave less residue on the shower cubicle. You’d need less soap, shower gel and shampoo too. Click HERE for the soft water version. Use offer code CPR1 for a free non-slip shower mat.